Identifying criminal records from fingerprints can take anywhere from a few days to a few months. Those first few days can make the difference when solving a crime. And, if the fingerprints are not identified, the criminal may never be caught. Unit can be used on crime scenes, in police cars, and at checkpoints and roadblocks. Fingerprints can be taken and cross referenced to the Karsof Central Database at the Police Department or other relevant agencies. The Karsof Forensic System will then notify the user with the results. If necessary, the search can be extended to the Interpol database. can be maintained at the Police Station so that every person admitted can be scanned. If there is a positive match, a facial image and additional information will be displayed. In addition, the scanner can be used at railway stations, cyber cafes, hotels, and other places that require closer monitoring. even works with incomplete fingerprints, such as those lifted from a crime scene. With a minimum 300 ppi print, all probable matches will be returned. Exact matches require 10 features to be positively identified. Karsof Forensic System uses biometrics and can be used to recognize fingerprints, faces, iris and retinas. 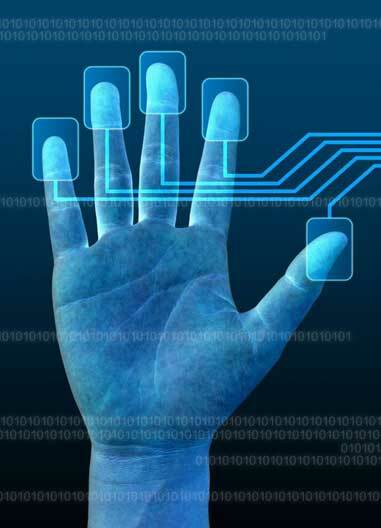 Now, with Karsof™ Biometric Technology, results are returned in seconds, no matter how large the database is. Lowest fingerprint data storage of 16 bytes. Fingerprints stored in WSQ format with compression. Supports image resolution up to 2000 ppi. Devices vary from 300 ppi to 2000 ppi. All biometric features (face, fingerprint, iris, and retina) integrated into one database and only one search required. Compliant with data interchange standards such as IAFIS, EFIPS, and EFPS.